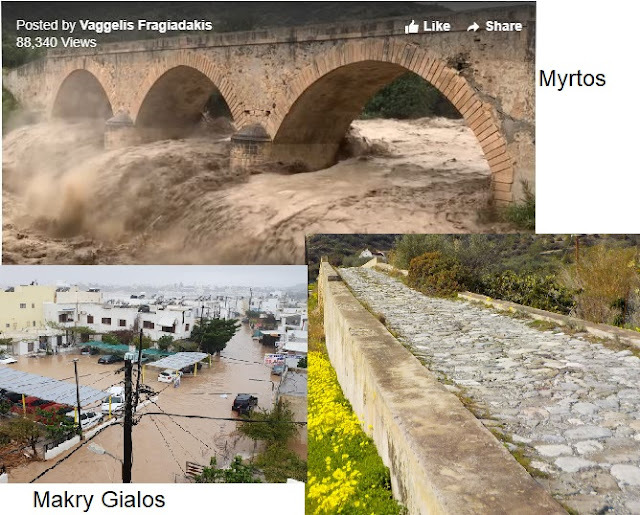 The temperatures are now hovering between the thirty to thirty five degrees centigrade mark, we have wall-to-wall sunshine and a lot of the local nature is beginning to wind down for the oncoming fierce heat of summer. So I thought that this morning we’d go down and do a bit of beachcombing and see what we can find of interest down there on the sand itself. Dragonflies are a lovely feature of the summer and here is a beautiful example before we even leave the garden. This one is called a Violet Dropwing; Violet because of its overall colouration which has more of a red/blue colour than its similar looking all red relatives and Dropwing because of its habit of standing with wings forward and abdomen poking upwards. It is a North African species but quite common along Mediterranean coasts. Now it’s time for this week’s quiz (no, it’s not a new feature I’m trying out for the blog it’s merely that I don’t recognize this fellow). I say fellow but I rather suspect that she is a lady. I’ve seen comparable pictures of Sac Spiders in a similar sandy habitat and I have a gut feeling that she may be one of these but I’d prefer it if she had a downy covering. If anyone does happen to recognize it perhaps they’d let me know. Quick, look up. Here’s a lovely bird of summer flying over. That, if I’m not mistaken, is an Eleanora’s Falcon. We tend to get them flying over in the summer months. Back in 2011 we had a flock of forty of them between the house and the cliffs. There are two colour forms (called morphs) and this is a dark morph, virtually all blacks and greys underneath. Incidentally, the Eleanor after whom the bird was named, was Eleanor of Arborea, a powerful fourteenth century judge from the island of Sardinia with a keen passion for ornithology. She was the first to legislate for the protection of a bird species. 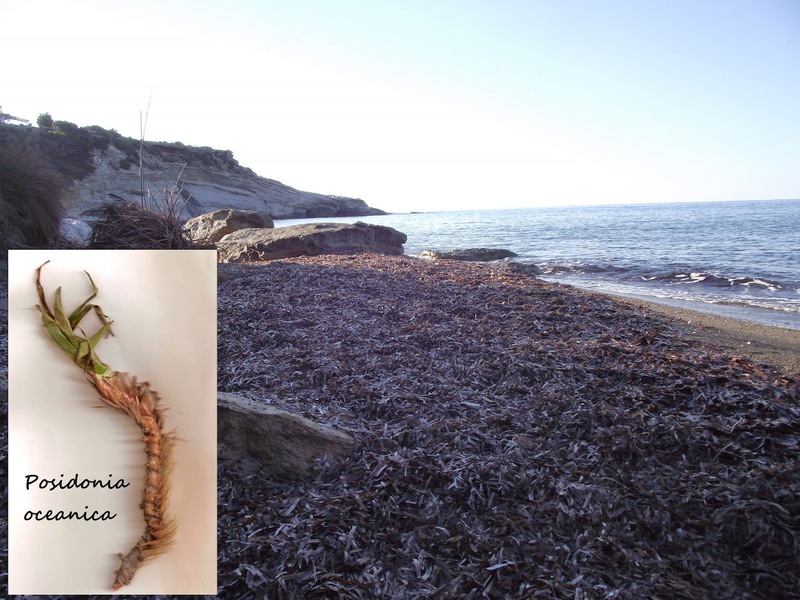 Here’s an interesting flower that you’ll only see in the Mediterranean or off the coast of southern Australia – yes, I’m talking about this mess of brown stuff littering the beach. These are blades of Neptune Grass (Posidonia oceanica) which lives on the sea bed. Not only is it a flowering plant that sets seed and reproduces in the usual grass-like way but it can also clone itself. A few years back Portuguese scientists studied the genetics of a colony of these plants and discovered that they were all the same individual, mass produced from the same original seed over ten thousand years ago. So what we are looking at here is the oldest living organism on the planet. Makes the mind boggle a bit, doesn’t it? I suggest we leave it to its own devices and go for a swim up the other end of the beach because, interesting though it is, it is not the pleasantest thing to swim through. Then we’ll go back to base and take a look at it under the microscope and see if it’s hosting any wildlife. I’ll just collect a few samples. Well, here we are back at base and I see that one of us has picked up a hitch-hiker. 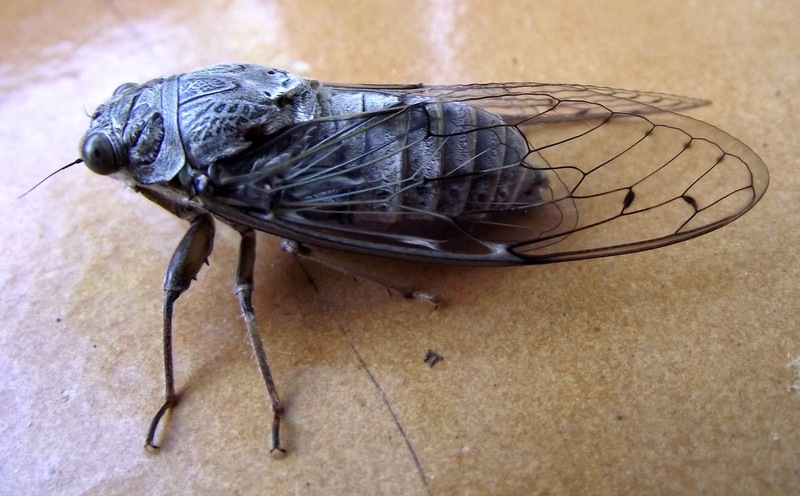 This is the little bug that’s responsible for the sound of summer: the cicada. The males actually produce three different calls; a territorial call that tells other males that this is my tree; a courtship song and a quick squawk of alarm if you catch or disturb them. As for their lifestyle they spend most of their lives underground as grubs feeding on the xylem of trees. Then, on their final moult, they dig a tunnel to the surface, shed their grub skins and emerge as winged adults to entertain us through the summer. After mating the female cuts slits in the twigs of trees, lays her eggs and when they hatch the grubs fall to the ground and start burrowing. I think that’s enough excitement for one week so lets say we’ll all have a nice cup of tea and then I’ll go and put that Neptune Grass under the microscope. Until next week – good hunting. Fantastic pic of the male Violet Dropwing. One of my favourite dragonflies from Greece.